It’s a very interesting time of development for the gaming industry. Nintendo released the Wii U last November, and after a somewhat lackluster release lineup, 2013 looks as though it could be the year that the Wii U really shows its potential. Not only that, but Sony recently debuted some of the technical specs and initial release lineup for the PS4, and Microsoft will most likely announce their next generation system at E3 in three months’ time. You know what that means to this writer? Absolutely nothing, as of now. I may be one fancy individual with the grace and nobility of Daniel Day Lewis, but as I have not yet acquired any oil fields in the deep south, I do not own a swimming pool of money. And despite what some gamers might say, food is slightly more important than new gaming pursuits. So I have been spending my recent gaming time going through the great RPGs of past years; games with rich and compelling worlds, well-written characters, an engaging combat system, and a beautiful soundtrack. I’m certainly excited for the new horizon of the gaming industry, but there are some games that I will always hold close to my heart. 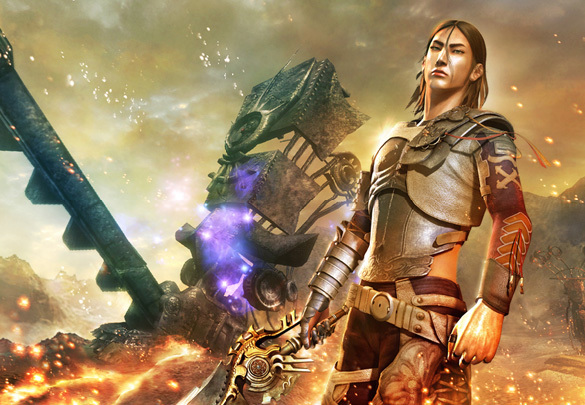 These RPGs are not major blockbusters like Final Fantasy XIII or Skyrim. They may have caught your eye once or twice, or were recommended to you by a wise friend, but you were too busy blasting halos with your gears of war to pay attention. So I thought I would share some of these wonderful games with you before the next generation systems are released and you spend all of your gaming time enjoying their 3D compatibility, super HD resolution, motion controls, six-layer axis controls, pineapple dongles, and other such things. Lost Odyssey was a game that I discovered shortly after I received my Xbox 360 and had been struggling to find a good RPG for the system. I enjoyed Halo as much as the next man, and Oblivion and Bioshock were wonderful, but my heart cried out for a traditional JRPG. After all, who doesn’t like scrawny characters with ridiculous hair who wield disproportionately massive swords and engage in hectic battles with twelve foot tall robots and small purple rodents? And so when I found Lost Odyssey on a discount shelf at Gamestop, I promptly took it home. The game opens with a beautifully rendered cinematic, in which a large army of men in funny helmets starts fighting another large army of men in funny helmets. There are a bunch of ridiculous war machines running around and magic spells are flying. It seems as though neither side can gain the upper hand when suddenly, the protagonist of the game comes soaring into the fray, cutting apart the enemy army of men in funny hats (conveniently wearing black so you know that they are THE ENEMY) as if they were made of tissue paper. After an introductory battle against some of the soldiers and an unnecessarily huge war machine, a giant meteor falls dramatically on to the battlefield, incinerating both armies. After the dust settles, the protagonist, Kaim, crawls out of the ground without so much as a scratch, gets his long black hair back in windswept position, and struts off into the sunset because no silly thing like the apocalypse is going to interrupt his schedule. From there, you learn that Kaim is a rare individual known as an Immortal (he’s been alive for an unspecified amount of time and cannot die) and has amnesia. Kaim is ordered to go investigate a mysterious happening at a magical research facility, on the basis that he’s immune to things like stabbings and being set on fire and meteor strikes and other such common hazards on the road. He is joined by another amnesiac Immortal (a girl named Seth) and a wise-cracking mortal named Jansen to form the introductory party on this great RPG adventure. This is a game that immediately captures your interest with its grand design and absolutely gorgeous visuals. You quickly discover that Kaim has the personality of a dejected walnut (this does change dramatically once you complete about 15% of the game), but you don’t really care. The music and scenery and absolutely wonderful side characters keep you going, and the story only gets more enthralling as time goes on. The combat can be rather lackluster at times, as it follows the simple turn-based mechanic of older Final Fantasy games. Each member of your party selects an attack or spell (most of which consume MP), the enemy does the same, and turn order is based on attack speed. However, this is not to assume that the game is easy or does not require specific effort. 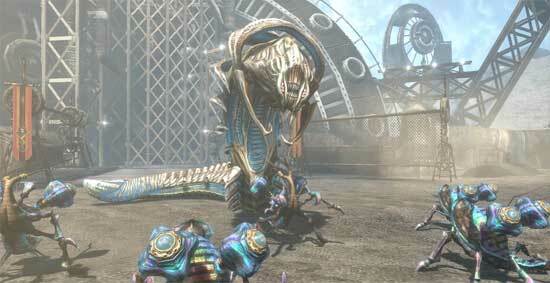 The boss battles are especially challenging, as even the early bosses can decimate your party in a few hits. Immortal characters do revive themselves with partial HP and MP after a few turns, but if each member of your party is knocked out at once, it’s game over. Another fun mechanic is the customizability of the Immortal characters. Mortal characters are simple: They fight, they gain experience, they level up, and they learn new skills. You just wind them up and watch them go. Immortals, on the other hand, do not learn any skills by themselves. Instead, they learn skills from mortals and accessories that they equip. This does mean that certain mortal characters might become less useful later in the game. One particular character solely exists for you to give his fancy unique weapon and armor equip skills to the Immortals in your party, and then you never use him again. It’s like bashing someone’s head with a crowbar in a dark alleyway and mugging them, except then you’re forced to drag the body around. But why do I recommend this game overall? It doesn’t make any revolutionary breakthroughs in the JRPG formula, but Lost Odyssey stands apart as an Xbox 360 game with some of the best world building, music, visuals, and character development I have seen in any RPG to date. So, if you’re a 360 owner, put down your copy of call of modern warfare for a few hours, go hunt Lost Odyssey down in the bargain bin of your local game store, and enjoy. Anyone who knows me knows that I will line up for hours to get my hands on a new strategy RPG, and then I will throw copies of the game at people and bother them until they play it. This usually manifests itself as me making people play various incarnations of Fire Emblem and then receiving innumerable complaints of “but this game is so boring, Nine” and “why are the outfits so weird, Nine” and “but Nine, this pegasus knight keeps dying” and “you can’t spend three hours crying about fictional characters, Nine” and “when can I stop playing this, Nine?” (I personally prefer not to answer. It’s more fun to keep them guessing.) However, I found that Valkyria Chronicles has a greater degree of accessibility while still retaining the delightful challenge of strategy RPGs. Do you like video games set in World War II? Of course you do! You’ve played Call of Duty 1 through 327! Fortunately for you, this is a very authentic WWII setting! Do you love trench warfare and tanks and snipers and grenades and having every single move count? Yes, I hear all three of you cry into the night! Do you love ancient races of super humans with ancient magical powers and weapons that fire ancient (totally not!Egyptian) laser beams? Capital, you’re interested! Let’s carry on. The game begins with some lovely cutscenes in Not!Eastern European nation of Gallia where a man drawing fish (Welkin) is arrested by the local village’s head baker, Alicia, who also happens to lead the local militia) for acting suspicious and taking an interest in nature. Before the inquiring gamer can question the validity of Alicia’s logic, the Not!Russian army starts invading, and Alicia hands Welkin a rifle and tells him to get to shooting. 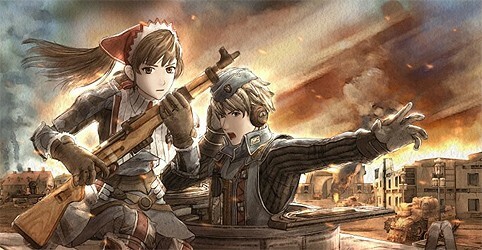 After failing to defend the local village from conquest, Welkin and Alicia join the army. Welkin is given command of a squad for virtue of being an experienced...a talented...okay, we don’t really know the qualifications, but he’s given a tank and sent off to war. Huzzah! 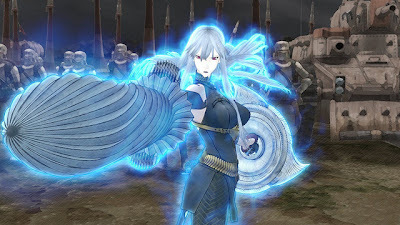 I adore Valkyria’s design and presentation, and the combat is nothing short of addicting. Each “chapter” in the game contains one or more battlefield missions. You form your squadron out of individual units of various classes. Each unit has his/her own unique character quirks, along with specific strengths and weaknesses. These skills are subtle, but a few tweaks to your combat roster could make all of the difference between victory and defeat. The primary classes are Scout (focused on mobility), Shocktrooper (offense and defense), Lancer (anti-tank/structure/anything you can hit), Engineer (repairing your tanks/removing mines), and Sniper (precision killing). A healthy balance is best, and you can customize your combat squad to each situation that you face. Combat is turn based, and you have a specific number of Command Points (used to move units) during your turn. You can usually move your tank and each member of your squad once, or you can move the same unit multiple times if you need to reach an objective quickly or take down a certain enemy. The goals of combat missions vary. Sometimes it’s a game of capture the flag, and sometimes you might be forced to rout all of the enemies or defeat a boss. 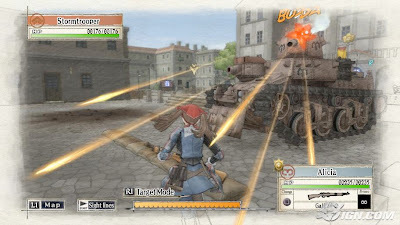 Strategy is naturally an integral part of Valkyria Chronicles, and every wrong move will be punished by enemy snipers, machine guns, and tanks. My peasant bonnet shields me from mere tank turrets! The plot of the game takes some interesting turns after a few chapters, and the traditional JRPG story begins to shine through. This is far from a bad thing. The story, characters, and overall presentation are engaging, but what really sells you is the gameplay. If you love strategy and want a truly enjoyable challenge, Valkyria Chronicles is a fantastic choice.